As Armenia and Armenians around the world mark the 100th anniversary of the start of the genocide against the Armenian people by leaders of the Ottoman Turkish Empire in 1915, it must be noted that not all Turkish people went along with what the Turkish Empire did. Yes, there is no question that the Turkish government of the time had intended to massacre and exterminate any and all Armenians, along with Assyrians and ethnic Greeks, within its territory. Yes, there is no question that an estimated one million to 1.5 million Armenians were annihilated by 1918 by the remaining Turkish Empire. No matter what the present day Turkish government may say, there was an intended plan of genocide against the Armenians and that this genocide was carried out with great efficiency. All this said, not all Turks went along with what the Turkish government at the time wanted to do. 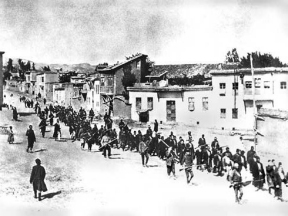 There are cases of individual Turks who risked their own lives to save Armenians by hiding them in their own house, helping them escape to safe areas outside the Turkish Empire, or giving Turkish troops sent to round up and kill the Armenians false information to save their Armenian neighbors. These Turkish saviors knew that if caught, the Turkish government would kill them as it would the Armenians. While there were individual acts of Turks trying to save Armenians, there were actually Turkish officials who took it upon themselves to save Armenian communities from their own government. One example was Celal Bey. Governor of Konya—a vast region in today’s Turkish Anatolia—Celal Bey intentionally disobeyed orders to help deport Armenians from Konya or helping to deport Armenians who had fled to Konya. Eventually he was fired from his position in Konya, but not before saving the lives of thousands of Armenians. Another Turkish hero was Governor of Ankara Hassan Muzhar Bey. Given the orders to deport all Armenians in his region, he refused, stating, “I am a governor, not a bandit.” He was eventually replaced, but had helped save many Armenians. Still one other example was Mustafa Bey, the district governor of Malatya. Although he could not prevent the deportation and subsequent murder of Armenians in his region, he managed to save some Armenians by hiding them in his home. Sadly, he was murdered by his own son for trying to save Armenians. These are just some of those who worked within the Turkish government to save the lives of innocent men, women and children. It did not matter to them that they were Armenians, but that they did not want to be accessories to mass murder, and did not want to see whole communities of Armenians removed and slaughtered. They knew better than anyone else the intentions of their own government, and they could not sit idly by while the Turkish government exterminated the Armenians. It is a tragedy that the current Turkish government, which denies the Armenian genocide to this day, also denies the existence of these men and other Turks who saved Armenians from the extermination campaign. We can only hope that there will be monuments to these brave souls in the near future.